Over the past couple months I've noticed a trend toward cable TV networks producing short webisode series solely for broadband distribution. It's still quite early, but the trend offers some insights into these networks' programming strategies. To date most cable networks have put a lot of promotional clips online and a few have even put some full length programs up as well. But for the most part cable networks have been constrained in how much original content they distribute online due to their lucrative monthly affiliate deals with cable/telco/satellite operators (though this too may change with Comcast and TWC pursuing online distribution plans). The webisode format breaks the traditional limitation of having a finite 24 hours/day of "shelf space" for networks to program. I think what's happening here is that cable networks are experimenting with the low-cost webisode format both to reach online users and also to see what might graduate to on-air. The webisodes allow them to bridge their brands between traditional TV and broadband to see what sticks. And some webisodes may even making money for their networks already. "Off Track" for example is showcased in an Armor All "Owner Center" sponsored environment. CNN's Freshman Year is a good example of how one network is pushing the envelope. In the series, CNN has given Flip video cameras to 2 new congressmen, who use them to show what life is really like on and off Capitol Hill (it's not glamorous that's for sure). The concept is a natural extension for CNN's politically-interested audience, and capitalizes on the tailwind of the '08 election cycle. While the production values are well below what's typically seen on-air, there's something compellingly authentic (and yes voyeuristic) about the wobbly, poorly framed footage offered up by the congressmen. For sure you come away with a far better sense of what these guys' lives are like than you would from a slickly-produced 1 hour special. All of the 7-13 minute episodes have pre and post rolls, from brands like IBM and Sprint. I've noticed CNN starting to promote the series through on-air spots as well, which is a key webisode audience-building all the networks have. 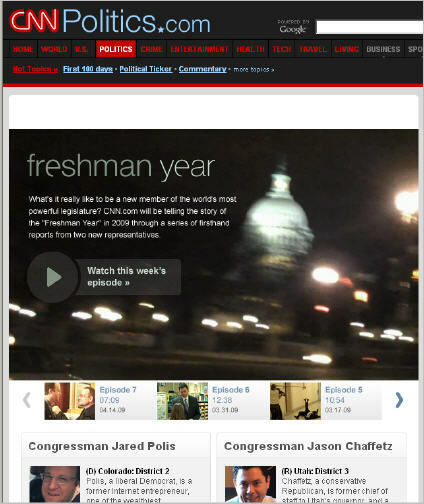 However, CNN really needs to make the series more visible on the web site. Aside from a periodic ad, a site visitor wouldn't know the series existed or how to find it. This is a common problem with the other networks' sites as well. It's way too early to know how sticky the webisode concept will be for cable TV networks, but on the surface I think it offers a lot of opportunity. Cable networks are not immune from audience fragmentation and consumers' changing expectations. Finding ways to reinforce viewer loyalty and generate additional revenues is a must.